On Wednesday 20th August, Richard and AndyG went to Capel Curig in North Wales for a few days camping at the Bryn Tyrch Farm. Having left Warrington late to avoid the evening rush hour traffic it was nearly quarter to eleven before they had pitched the tents and it was time for beer. Oh calamity, the Bryn Tyrch Inn was already closed! Fortunately, after a brisk walk down the road, Cobden's Hotel proved to be more hospitable to the late night travellers. Thursday got off to a bad start with heavy cloud and even heavier rain. However, after a trip to Portmadog, a stand up lunch from a bakery in the high street and the obligatory mug of tea in Eric's Cafe, conditions at Tremadog were sufficiently improved to permit a little climbing. Thinking to ease into things gently, they started with Oberon 170ft Severe. 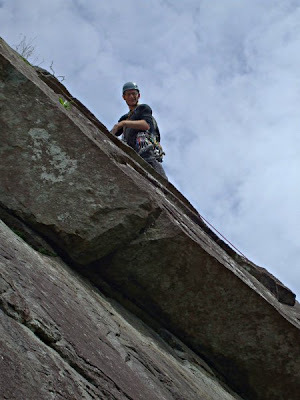 Despite an entertaining slabby first pitch, the rest of the climb proved uninteresting and was swiftly despatched in the hope of finding better things. It was decided to try Merlin 160ft VS, so AndyG led the first pitch which involved some pretty tenuous technical climbing up a steep groove leading to an overhang which is avoided by swinging out left on a block. Then it was Richard's turn and, after starting up the strenuous cracks on the second pitch, he opted to do the Direct Finish 80ft HVS. 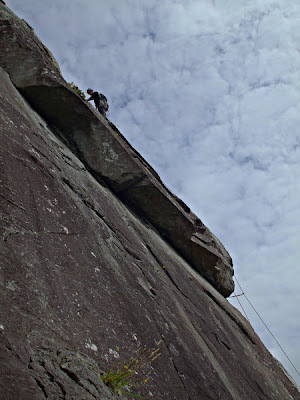 This was an impressive personal achievement for Richard, his first HVS lead coming almost exactly a year after his first trip to Tremadog as a novice climber. 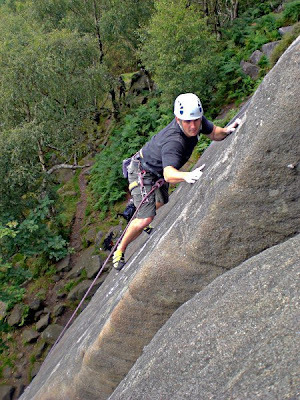 Merlin Direct is a proper HVS with strenuous cracks, small holds and steep face climbing in a spectacular position high on the front of the buttress. It is so good it was on the back cover of the 1978 Climbers' Club guide to Tremadog and the Moelwyns. AndyC arrived on Thursday night so the next morning an intrepid three-some set out on the short trip down the A5 to Ogwen. 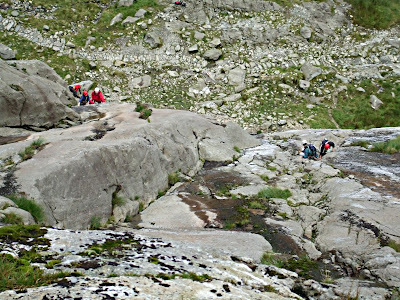 AndyG started things by leading the HVS Direct Start to Tennis Shoe on the Idwal Slabs. Next followed alternate leads along the edge of the main slab until AndyC got the final pitch up to the perched boulder. Then it was Richard's turn for a bit of entertainment. "Original Route. This is the route of the wall. 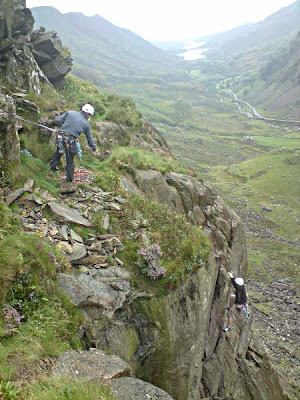 A fine old climb that has fascinated generations of climbers." Sounds good, doesn't it? However, it turns out to have a sting in the tail in the form of a gruesome off-width crack. 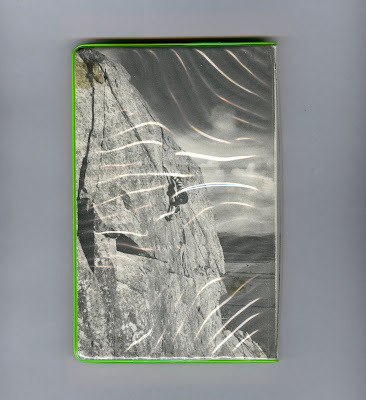 At first Richard was disappointed to have climbed the pitch by escaping out onto the wall on the left, however careful scrutiny of the guide book reveals that this was also the method favoured by the first ascensionists in 1918. 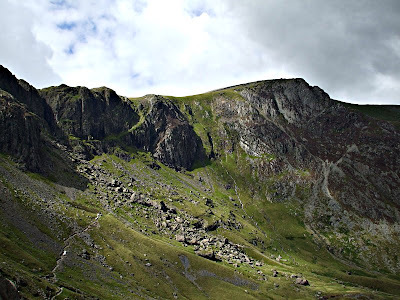 AndyC finished the days climbing by leading Groove Above, after which Seniors Ridge was followed to the summit of Glyder Fawr, before descending the footpath past the Devil's Kitchen back to Llyn Idwal. On Friday evening they were joined in the Tyn y Coed by Graham whilst they were enjoying a well earned pint or three. Saturday morning started bright and early. The campsite was briefly visited by Tall Ian of windmill abseiling fame, however he had plans to go walking to improve his fitness for a late season trip to the Alps. Everyone else got away early to make sure they were parked up in the layby opposite the Cromlech Boulders in time to meet Mark and Ste for a days climbing on Dinas Mot. AndyC and Graham did The Cracks closely followed by Richard and AndyG on Lorraine. Meanwhile Mark and Ste were supposed to be doing Western Slabs (VS 4c) , however Ste went off onto The Chain (E1 5b) and took his first (and second, third and fourth!) outdoor lead fall. After lunch, AndyC and Graham wandered over the road to do Crackstone Rib on Carreg Wastad while AndyG and Richard just managed to finish Western Slabs before the rain got too bad. However, that left Ste having to try and second the final pitch of Superdirect E1 5b in the rain. Nice. 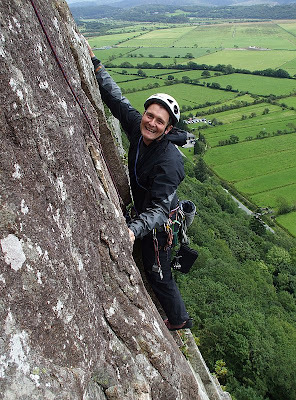 Sunday saw a return to Tremadog for Richard where he led Scratch and Scratch Arete with AndyC whilst Graham and Dave did Valerie's Rib and Poor Man's Peuterey. Monday was wet and overcast all day so a visit was made to the Llechwedd Slate Caverns. Despite the Welsh propaganda of the recorded commentary on the deep mine tour, this is well worth a visit and the size and number of the caverns is quite remarkable. On Tuesday morning it was still raining, so Richard and the two Andys departed leaving Graham and Dave to travel onwards to Holyhead in search of better weather, of which we shall expect to hear more in due course. 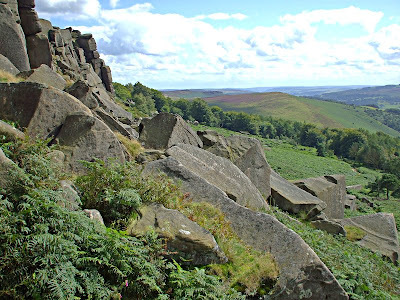 Despite the generally wet weather that was forecast for the weekend it remained mostly dry at Stanage on Sunday. Pope Paul had a pass out and was on pilgrimage to his favourite rock with AndyG to put the rope up for him. They started with Right-Hand Trinity 14m Severe 4a 2*, then Central Trinity 16m VS 4c 3* and also Christmas Crack 16m HS 4a 3*. By which time AndyG was thoroughly tired of sloping holds, jamming and thrutching around. However, it was much too early to pack up and go home so they strolled along past the Plantation and AndyG led Wall End Slab 22m VS 5a 2*. Paul then took the opportunity to top-rope Wall End Slab Direct 14m E3 5c 2* which he almost completed except for going off route on to harder ground at the very top. Naturally this resulted in the usual enthusiastic outbursts from Pope Paul about the superior nature of gritstone and it's gravity defying properties. Looking for something quick and easy to end the day on, they moved along to the Outlook Buttress Area. There AndyG quickly spotted the very attractive looking Lookout Flake 8m HS 4b 1*. The start is thought provoking, the wall is deeply undercut and requires a high step into a very committing layback position. However, a sharp pull rapidly gains height and easier holds, leading to a small foot ledge and then a larger ledge on the top of the flake from which it is just an easy pull over the top. On returning to the bags after soloing it, AndyG found Paul already high on the route and got his camera out to record events for this website. Unfortunately, that was when it all went wrong for Paul. Despite being in a great deal of pain from what was believed to be a broken arm, Paul was eventually able to walk back down from the crag to the Plantation car park. AndyG then drove him back to Warrington where he was admitted to hospital. Paul had surgery on Monday evening, he was taken to the operating theatre at 4pm and was returned to the ward just after 8pm. Apparently his elbow was dislocated as well as fractured. The bones pinned and plated back very well, but the ligaments on the bottom of the joint were badly torn and those on the top had to be removed completely. Paul was allowed to return home on Tuesday. His arm is now in a kind of splint and he can move all his fingers without pain. The elbow will require a lot of physiotherapy and it is unclear at the moment how much strength and movement he will regain. Close analysis of stills from the video suggest that Paul was actually very lucky not to injure his pelvis and back. Although his elbow is badly injured it appears that this has saved him from injuries with potentially much more serious consequences. Paul thanks everyone for their good wishes and messages of support. Hopefully he will see you all down the pub soon for a Guinness or two. It was raining in most of Wales on Sunday. "Quelle surprise!" I hear your French pals saying. However the experienced climber always has a little gem of hard earned knowledge tucked away for moments such as this. A little nugget of local information to lighten the darkness and provide a glimmer of hope. 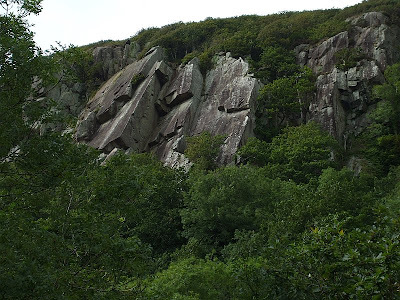 Often when it is wet and cloudy on the higher peaks of Snowdonia, it remains dry and relatively bright on the pleasant south facing coastal crags of Tremadog. It was not surprising then, that when AndyG and Pope Paul arrived at Eric's Cafe they should just happen to bump into Jonah and PaulV coming out of the front door with big steaming mugs of tea in their hands. Shortly afterwards we were also joined by Dave, Derek, Paul and Trevor. More members in one place than on an official club meet! After a bacon butty and a mug of tea, AndyG led Pope Paul up Scratch 170ft VS 4b whilst photographing Jonah and PaulV on Scratch Arete 200ft HVS 5a. 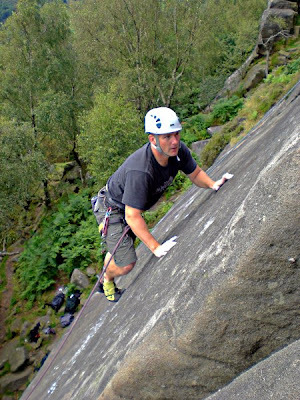 Leading Scratch was a personal milestone for Andy because he had been led up it years ago whilst on a beginners' course at Plas y Brenin. Meanwhile Jonah and PaulV had moved on to Poor Man's Peuterey 200ft Severe while, on their recommendation, AndyG led Pope Paul up Scratch Arete. After 370ft of climbing in the warm afternoon sunshine AndyG and Pope Paul were ready for a break. However Jonah and PaulV, keen as ever, continued with Meshach 190ft HVS 5a. Returning to the cafe, we spotted several familiar faces and acquaintances from the Liverpool and Warrington climbing walls. Meanwhile, it appeared that the others had already left, presumably because Trevor was ready for the pub. After a few more mugs of Eric's finest tea, Pope Paul and AndyG set off for the drive back through a still overcast and rainy Snowdonia, and marvelled at our good fortune in accomplishing such excellent climbing on such an apparently bad day. Some of the chaps were at Froggatt on Saturday. Amongst other things they had a look at Three Pebble Slab 12m E1 5a 3*. It's right next to Four Pebble Slab, "Wow," I can hear you say, "An extra hold, it must be a doddle!" Anyway after a little top-rope practice Mark finally discarded any remaining sense of self-preservation and led it. Four Pebble Slab 12m E3 5c 1*. The picture speaks for itself. I don't think any of us have ever seen Mark looking quite this focused before. A brave lead and a fine achievement for a climber who has been pushing his grade ever since we have known him.